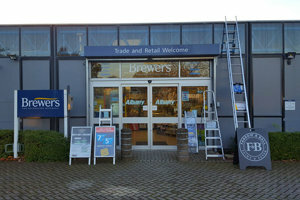 Our Alston Drive branch is one of two Brewers Decorator Centres in Milton Keynes; we’re in the north of town, while painter decorators and retail customers in the southern part of town often head to Brewers Bletchley. Our store used to be an independent paint supplier called Colours; we joined the Brewers family back in 2003. We offer a large range of paint brands, wallcoverings and decorating necessities, as well as interior design consultations and even site visits to make sure you’re recommended the right products for the job in hand. We’re all keen DIYers and have an ex-painter decorator on the team, so you’re in good company. We’ll also make sure you have free tea and coffee while you browse. We’re conveniently located in the first unit of Priory Court, off Alston Drive, before the Chinese supermarket. Take the Milton Keynes North & West turning off the A5 and then the Milton Keynes East/Newport Pagnell A422. Follow the sign at the next roundabout for Bradwell Abbey, and you’re on Alston Drive.